The announcement that journeyman visual effects guy-turned-director Joe Johnston was attached to this project wasn’t really a cause for celebration. His body of work consists mostly of adequate, though ultimately unmemorable, ‘effects’ films (Jumanji, Jurassic Park 3, Wolf Man). Johnston’s been around the block and so we wouldn’t even get a fresh new voice into the mix. However, after watching the first few scenes of Captain America I started to come around. The WWII setting of this picture under the faux war effort-style propaganda filmmaking style of Hollywood in the ‘40s brought back memories of the underrated comic book film from 1990, The Rocketeer, which was directed by... you guessed it, Joe Johnston. The pieces of this puzzle were now fitting together. 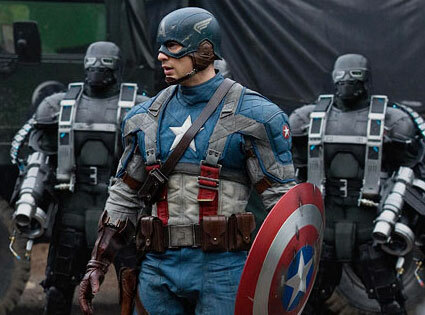 Captain America is the last of another puzzle, the Avengers Saga, an ambitious undertaking by Marvel Entertainment that began in 2008 with Iron Man to create a series of independent feature films that fed into a ‘super-group’ movie, The Avengers, due out in 2012. Iron Man was a fantastic film. The Incredible Hulk that same summer was decent and a sign that this might just actually work. Next came Iron Man 2 in 2010, which was a dreadful quickie sequel that betrayed the inspiration of the first picture. And then Thor came out earlier this year, which, like IM 2, was mostly awful. But now the series picks up a bit of its mojo with Captain America , a rousing actioner with spirit. It’s 1941 and America is recruiting soldiers to fight abroad. One of the hopefuls is Steve Rogers (Chris Evans), a meek, scrawny weakling who gets denied service, but through perseverance and a bit of cheating he will not take no for answer. After witnessing Rogers’ steadfast patriotic belief and determination to stand up for himself, German ex-pat scientist Dr. Abraham Erskine (Tucci), recruits Rogers into the military to be a guinea pig for his experiments in body enhancement. And at the first act turn, the meek Rogers is transformed into a beefcake ubermench with super strength and lightning speed. But instead of going to Europe, Rogers becomes a spokesman for war bonds, prostituted in recruitment revival shows, ads and USO concerts. When Rogers’ best friend goes missing in Italy, Captain America goes AWOL and arranges a secret rescue mission. All the while, Dr. Erskine’s old rival, Johann Schmid (Hugo Weaving), is conducting similar experiments on his own with his splinter Nazi group called Hydra. Rogers quickly recognizes Schmid as the real enemy he needs to excise, thus sparking a battle of ages, one which will likely spill over into the present and involve the other superheroes from the other movies in The Avengers. Unfortunately, what fails the pictures is Joe Johnston’s action scenes. Once Cap’n America gets to Europe and is engaged in Nazi-fighting, Johnston curiously chooses to show much of this action in montage form. We’re deprived of a few set pieces, full-length scenes with a build-up and payoff. Instead, we see a series of random shots of jumping, punching, motorcycle riding and explosions without anything tying it all together. Johnston, thought a special effects expert, uses too much of it. As such, we get the feeling that during most of the action Evans is in front of a green screen on soundstage, and NOT in the forests of Western Europe or the snow-capped Bavarian mountains. This takes us out of the anchored reality in which we were placed in the first act. But what Captain America does better than Iron Man, Thor and The Hulk is set up The Avengers movie and tie together some threads from the other pictures. Dominic Cooper's Howard Stark character, thus Robert Downey Jr.'s father, is a clever link-up. It’s the same with the other worldly motivation of Hugo Weaving's character, which suggests a link-up with the alien gods of Thor. And with the Easter egg clip and trailer at the end of the credit I'm sufficiently teased. That's all I wanted and Captain America delivered.